This photo is from the ex-job, about five weeks ago; the show was over some time ago, but I'm only now getting around to writing about it. Also: I really wish people would think before they name plants things like "fedtschenkoi." I'm sure whoever it was thought that they had a good reason for naming it that, but come on. There's no reason good enough to inflict a consonant blend like "dtsch" on the world. It's not even funny. I could forgive it if it were done for comic effect. 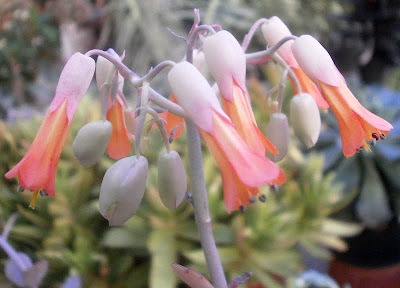 In my mind, this plant must be "Kalanchoe Fetchin'Koi", complete with handy little fishing nets. As far as I know, the plant was named in honour of the russian botanist Boris Alexeevich Fedtschenko (1872-1947), who was director of the Saint Petersburg Botanical Garden. Believe it or not, but in russian language the combination of tsch is actually one cyrillic letter ч :). Mr and Mrs Fedtschenko and son might disagree about their remembrance by posterity. Along with Sedum fedtschenkoi, Pseudosedum fedtschenkoanum, Rosa fedtschenkoana and, probably, many more. Instead of trying to pronounce the name I'm going to look at the lovely flowers. Orchideya, Boris Alexeevitsch was the son who was trained and accompanied on expeditions by his mother Olga Alexandrovna. She had partnered his father Alexei Pavlovitsch on a three year botanical expedition but Alexei died in a climbing accident on Mont Blanc eight months after the birth of Boris (who was born in Russian 1872 but western 1873). I know some plants are said to be named after Olga Alexandrovna, not sure if the family Fedtschenko were all honoured in that way. Actually, the name's spelling looks SO weird to us because it is (for some reason) spelled according to the rules of German language. In German, the sound which corresponds to the English "ch" is written as "tsch" (as in word "Deutsch" - "German").